This post is coming later than planned as I took a week out. I could have uploaded earlier, but as the title says [while still fitting in with the naming structure set out at the beginning of the year] there are certain events this month happening. Not in the same way as last month, where I was at Summer of Sonic, but still events. Currently I am sat in my university room awaiting the start of the last year. My last year. That doesn't mean I won't be updating things here, of course. I still have plans, and they will happen - including the sad demise of a name. Cyber Digital Services was a name - a name I had so often used when younger and fantasising over running an entire business of media related works. I still want the name to live on, though I realise at the core I've been doing things under a different name. My Youtube channel has been under that name for quite a time, and a character of that name also exists within Doctor Who: The Star Wars Chronicles. This period will be a slow transition though. Throughout the rest of the year, there will be changes to the banner of CDS Media, though as I'll be explaining in a bit, that website will no longer be the main source for the stories themselves. In June I mentioned The Chameleon Chronicles would be the first story to be published to WattPad. 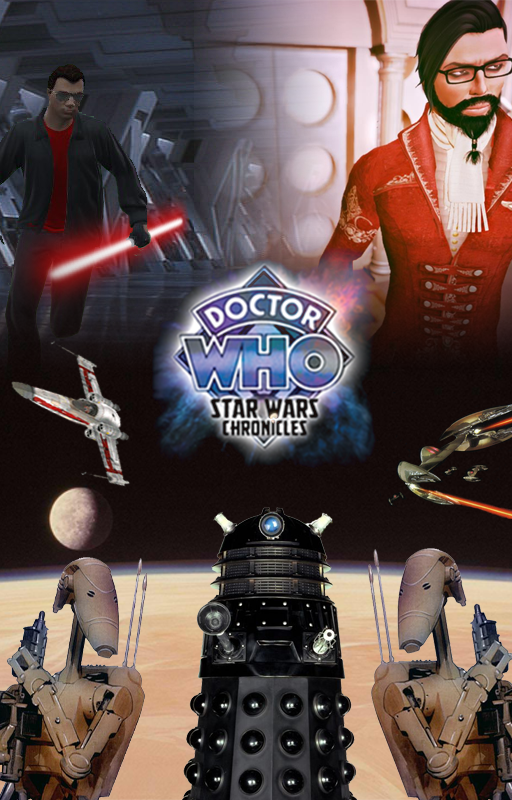 At the end of last month, Doctor Who: The Star Wars Chronicles had its first episode uploaded. And I use episode where previously it was act. Each act will now be brought under an episode title, whether that be one used within the act or something relating to the arc itself. Those acts that featured an episode of the audio series will go under the audio series' title, though episode four will be split between the original four and five it was meant to be. The rest of the acts will follow, and this month the Qiilura arc will be finished. That will have a name of its own, and follow the rest. The cover below was made using various assets, including a Second Life render of Jaz's character as The Doctor which he kindly supplied, as well as DarkRula in GTA Online form. Now, you might be wondering why the change to Wattpad. The answer is a simple one. Weebly has done everything I have wanted from it from when I first set it up. Sure, a few mishaps, but nothing that seriously affected how I handled the site. There is one thing I had noticed and tried to rectify in various ways though. It just isn't very good at being an ebook site. WattPad makes things easier to manage on both creator and user ends. The biggest of which is proper chapter markings. Sure, I can easily do that on Weebly by creating a new page. But then that chapter marking is a sub-page within a page. If I keep making them, it gets difficult to manage when there are over ten, and on multiple pages at that. So just hide them all have a single page with chapter links on it. It still requires navigating back to the main page to get to a new page or a link to get to the new page. Wattpad makes things simpler because it was built to be an ebook site. Chapters are always listed in the drop-down menu, you can easily get to the next chapter, and there are numerous ways to quickly share and comment, with the creator easily being able to see that. CDS Media will still be updated with the new content, but it will no longer get that content first. Enough about that though, as there are numerous other things to get through. The rumour mill has been turning again, and suggests that Nintendo will finally be revealing what the NX is all about this coming week. It will be interesting to finally see what Nintendo have for us. I still admit the WiiU was a good console, with hits like Splatoon and Mario Kart 8 defining their respective genres, and even getting the exclusive LEGO City Undercover being a bonus. There is no denying it failed to garner success though. The NX needs to impress. With it possibly being too late to gather my thoughts as to what I hope this thing could become, I'll be covering the news with my thoughts when it does get announced. As for around the network, I hope to have another set of GTA Custom Stunt Races to show off. It's definitely fun to create outside of the set structure of the map, though it can still be a bit restricting in areas. That video will be up on my Youtube channel. I also hope to be covering Sonic Generations again with another Custom Song video. However, I might be doing something a bit different with it. Once it is uploaded to the SONM Network, I'll be sure to link it on social media and include it within the playlist on Youtube. I might also have something else on the horizon to upload there beginning of next month. As for Wattpad, during the introductory stage of it during these last few months, I plan to do a number of crossovers. These will be included in the Crossover Corruption story once it is added to the site. These will be alternate universe, being my style, and the first one features one of my core three franchises crossing over with a magical world. There is also the matter of the third part of Doctor Who: The Star Wars Chronicles Look Back, Look Ahead series. I'd left the second part off just before I start talking about how I adapted audio episodes one and two into the written fiction. This post will decide whether a part four needs to happen. I don't think there is too much more to cover, since while I do want to give some teasers about the future, I don't want to be giving everything away. The link to my Wattpad account will be linked on the main of the blog, as well as uploaded to social media. It will also feature in next month's update post. That's all for now, so bye for now.